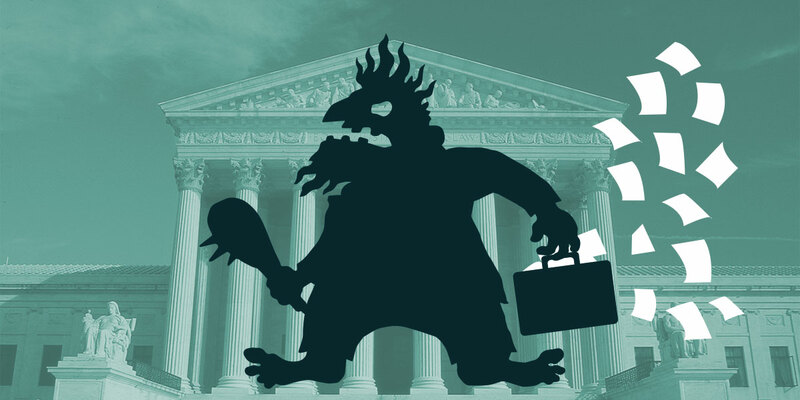 Today the Supreme Court issued a decision that will have a massive impact on patent troll litigation. In TC Heartland v. Kraft Foods, the court ruled that patent owners can sue corporate defendants only in districts where the defendant is incorporated or has committed acts of infringement and has a regular and established place of business. This means that patent trolls can no longer drag companies to distant and inconvenient forums that favor patent owners but have little connection to the dispute. Most significantly, it will be much harder for trolls to sue in the Eastern District of Texas. For more than ten years, patent troll litigation has clustered in the Eastern District of Texas (EDTX). Patent trolls began to flock there when a judge created local patent rules that were perceived as friendly to patent owners. The court required discovery to start almost right away and did very little to limit costs (which were borne much more heavily by operating companies because they have more documents). Cases also tended not to be decided by summary judgment and went to trial more quickly. These changes led to a stunning rise in patent trolling in EDTX. In 1999, only 14 patent cases were filed in the district. By 2003, the number of filings had grown to 55. By 2015, it had exploded to over 2500 patent suits, mostly filed by trolls. Patent litigation grew so much in EDTX that it became part of the local economy. In addition to providing work for the local lawyers, it generated business for the hotels, restaurants, and printers in towns like Marshall and Tyler. Although the TC Heartland case will have a big impact on EDTX, the case involved a suit filed in the District of Delaware and the legal question was one of statutory interpretation. Prior to 1990, the Supreme Court had held that in patent cases, the statute found at 28 U.S.C. § 1400 controlled where a patent case could be filed. However, in 1990 in a case called VE Holding, the Federal Circuit held that a small technical amendment to another venue statute—28 U.S.C. § 1391—effectively overruled that line of cases. VE Holding meant that companies that sold products nationwide can be sued in any federal court in the country on charges of patent infringement, regardless of how tenuous the connection to that court. Today’s decision overrules VE Holding and restores venue law to how it was: corporate patent defendants can only be sued where they are incorporated or where they allegedly infringe the patent and have a regular and established place of business. Together with Public Knowledge, we filed an amicus brief urging the Supreme Court to hear this case, and once it did, another brief urging it to overrule VE Holding. We explained that venue law is concerned with fairness and that forum shopping in patent cases has had very unfair results, especially in EDTX. While the Supreme Court reached the result we hoped for, the court did not discuss these policy issues (it also showed little interest in the policy debate during the oral argument in the case). The court approached the case as a pure question of statutory interpretation and ruled 8-0 that the more specific statute, 28 U.S.C. § 1400, controls where a patent case can be filed. While today’s decision is a big blow for patent trolls, it is not a panacea. Patent trolls with weak cases can, of course, still file elsewhere. The ruling will likely lead to a big growth in patent litigation in the District of Delaware where many companies are incorporated. And it does not address the root cause of patent trolling: the thousands of overbroad and vague software patents that the Patent Office issues every year. We will still need to fight for broader patent reform and defend good decisions like the Supreme Court’s 2014 ruling in Alice v CLS Bank.